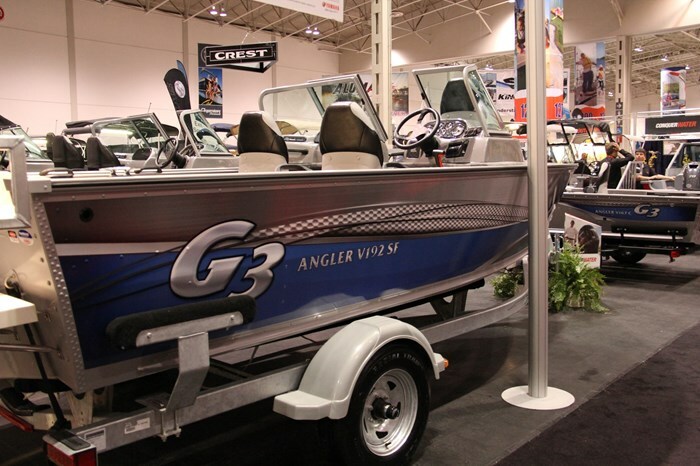 G3 Boats of Lebanon, Missouri, a Yamaha Marine Company, for 2015 offers more than a hundred models of riveted and all-welded aluminum fishing boats including Eagle Mod-V bass boats, Angler Deep-V, Guide-V, and Bay series fishing boats, Gator Tough and regular Jon boats, plus SunCatcher pontoon boats. The new for 2015 Angler V192 SF subject of this review, is nineteen feet, two inches length overall on a full eight foot beam and is second largest of the thirteen model Angler series ranging from sixteen and a half to almost twenty-one feet. 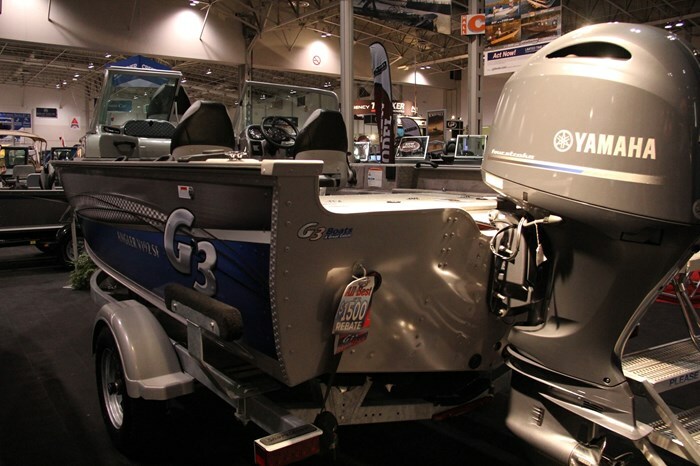 The largest five of these thirteen wide-body Deep-V models, including this Angler V192 SF, feature G3’s GX2 double-plated bow and bottom for extra durability in critical high-wear areas. All but three of the thirteen models in this series, and including this V192 SF, have three-piece hulls with full length riveted keels and double riveted seams with concave spray rails, wide reinforced gunnels and G3’s exclusive Z-BEAMTM stringer system. As with almost all of the Angler series models, versatility, convenience, and quick convertibility between focused fishing and family fun are key feature ingredients and you will find all of them in the V192 SF. 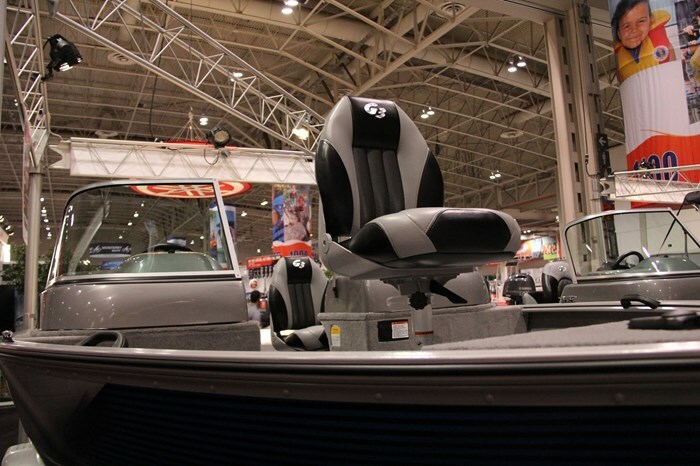 Three of G3’s contoured high back, padded, upholstered fold-down fishing seats are provided along with seven seat bases – four in the cockpit and one on the bow casting deck and two on the stern deck – to allow you to choose your perfect fishing location on board. Additional seating useful for family outings is neatly provided by a full width, 3-seater stern bench seat that flips forward and down with its underside level with the now hugely enlarged stern fishing deck. Under the port side of this convertible bench seat is a built-in portable baitwell; under the middle portion is a large 35-gallon aerated recirculating livewell; and beneath the starboard portion, a storage compartment. Off the starboard transom is a standard equipment half swim platform with folding ladder. Easy to clean and maintain vinyl flooring covers all horizontal surfaces in the V192 SF and almost every available interior space is devoted to storage compartments. Lockable storage for fishing rods up to eight feet long is conveniently accessible between driver and passenger within the forward casting deck and additional lockable rod storage is found within a top-loading inside gunnel storage box on the port side of the cockpit. A similar but shorter general storage box is on the starboard cockpit side. In all, there are seven lockable storage compartments on board. A second 15-gallon capacity livewell is located on the port side of the forward casting deck with a similar-size storage compartment on the starboard side of this forward deck. Two additional storage compartments fill the forward portion of the bow casting deck. 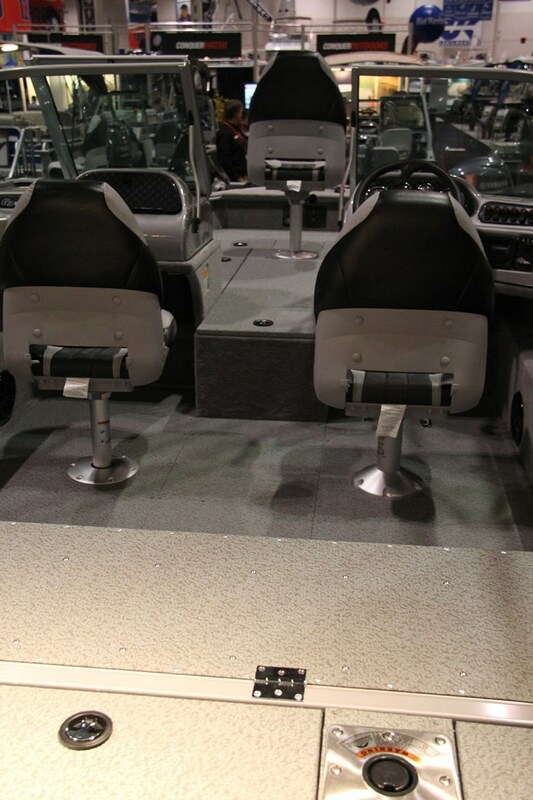 Right at the bow is the trolling motor mounting platform and comes standard with a 24-volt receptacle. 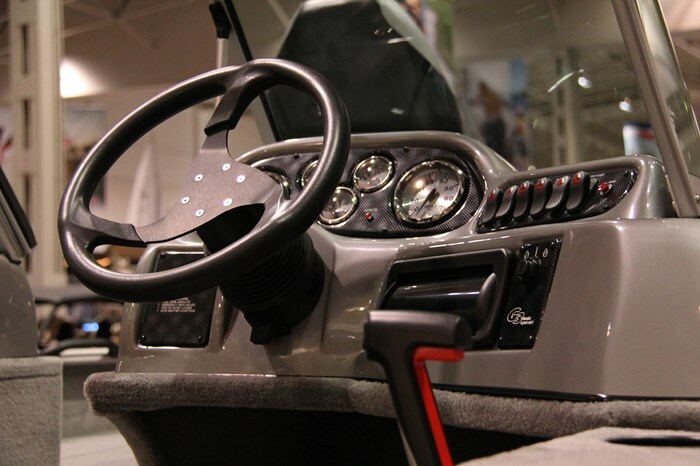 A custom molded fiberglass reinforced console with custom tilt steering wheel and standard hydraulic steering features a speedometer, tachometer, plus trim, fuel, and volt gauges along with a standard Alpine® stereo with advanced Bluetooth® capabilities plus a 12-volt receptacle. Topping the driver and passenger consoles is a high, wrap-around, centre walk-thru windshield – perfect for our Canadian weather conditions to provide protection from the elements while providing excellent visibility. A glove box is built into the passenger console. 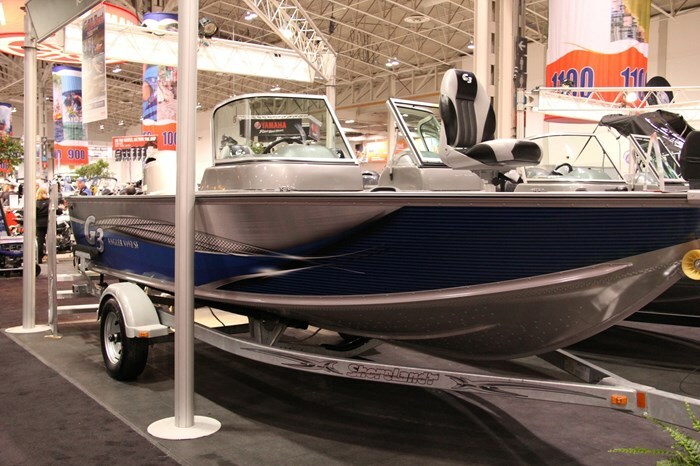 The Angler V192 FS is rated for eight persons on board and up to 200 horsepower – Yamaha of course. 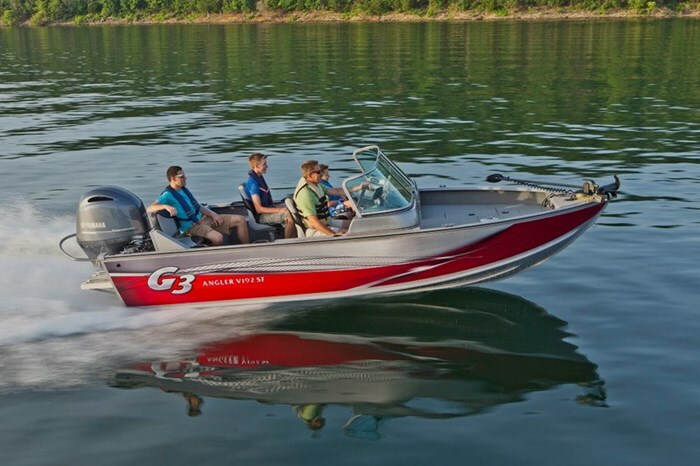 G3’s own performance test reports show that, equipped with a Yamaha F200 XB, optimum cruising speed is almost 23 mph with a top speed of almost 53 mph. If this is more than you want, you can also choose a Yamaha F150 or F175 outboard. Other notable standard equipment that comes with the Angler V192 FS includes your choice of custom wrap red or blue hullside graphics applied to the two component metallic silver urethane paint finish, slotted gunnels with accessory track plus snap-cover track, plus a Bear® powder coated Trail Guard® trailer with locking detachable tongue. Notable optionally available equipment includes three choices of Minn Kota® trolling motors including one iPilot® model, several choices of Garmin® echo™ GPS/fishfinders, several trailer upgrades, plus a ski-tow bar, snap-in cockpit carpet, and several canvas options in charcoal or tan from a mooring cover to full enclosure. You may also want a T9.9 Yamaha kicker motor.